The Daily Float: Winter Fishing? Not a lot of fishing going on here at the moment, unless of course you feel the need to stare down a small hole in the ice while freezing your a%$ off and trying to drink an extra beer cause your buddies are all forcing that next frosty beverage down their gullet, even though it's only about two whole stinking degrees out! Sorry, I can do that on my couch while I watch football! It has been brought to my attention by one of my guides and good friend Nick, that it's been since August since my last entry here. How did that happen you ask? Pretty easy I realize, as I round up my end of the year reports, and grasp a better understanding of how I was on the water more this year than last. Sometimes you have to see something on paper to get the big picture I guess. The whirlwind of day after day on the water, with nothing but visions of rising trout and thoughts of new flies to tie and try, all dancing in my head at night when my head finally hit the pillow, have been replaced with the anticipation of the next days hunt. Yes, myself and a lot of the guides of Double Up have been out chasing fur and feather for the winter tying bench, and stacking those coveted packages of wild game meat in the freezer. The pheasant tails, spun deer hair head hoppers, and CDC wings a top some great little mayfly patterns will be stacked to the top of the box in 2010. The elk hair caddis may be a little sparser this next season, as once again I passed up some smaller ones in hopes of the big bull getting a little closer into bow range. Oh well, you can't eat a story or tie a fly out of it, but I can always find a buddy with an extra chunk of premium elk hide to spare or trade for tying. Other than that, I can tell you it was one heck of a great fall out here in Montana, with lots of big browns eager to snap up the big dry, and then crushing the streamers through a lot of October as well! We had a super cold snap in early October this year with temps much like our past week here. We are talking a high of eight or nine degrees for pete's sake! Unheard of for that time of year. I can handle that now, as I fill out my outfitters report, but not in early October. That little snap cost me more than a few trips, but I'm pretty sure it made the fishing rock that much more for the rest of the month. Wish I could pop more pics up here, but visit us on Facebook if you would like to see some more great shots from this late summer and fall. Outfitting report is almost done, and we still have until the middle of January to bang on the geese, ducks and deer. I thought about ice fishing again today, but I think I'll wait until it's in the teens at least out here. The fly tying bench is cleared, and Skwalla season is fast approaching. 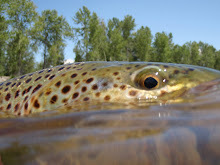 Oh yeah, Big Dries, and Big Browns, coming soon to a river near me! More fishing videos are in the works, and I'm thinking of putting on a few fly tying videos up on here to, if I can ever wade through all the footage we have at this point anyway. Happy holidays everyone, and I'll try not to wait three months for the next entry here.